Inspired by traditional design, the Hampton vanity has premium features, such as raised panel doors, large capacity drawer boxes and smooth operating drawer glides. Available in a variety of sizes with durable oak and white finishes. Cabinet hardware is included. This 60 inch Naples vanity pairs beautifully with the 61 inch Lily White engineered stone vanity top and attached rectangular double under-mount vitreous china bowls. Constructed of durable woods, this vanity is enveloped in an Antique Walnut finish and accented with black birdcage-style hardware. This 60 inch vanity features 6 full-extension, dovetail drawers that provide ample storage space. Behind its 2 beautiful doors lies an even larger storage area that's perfect for stacks of towels and a wide array of bath, skincare and household items. The marble top is easy to install to the vanity and will add a finishing touch to any bathroom. 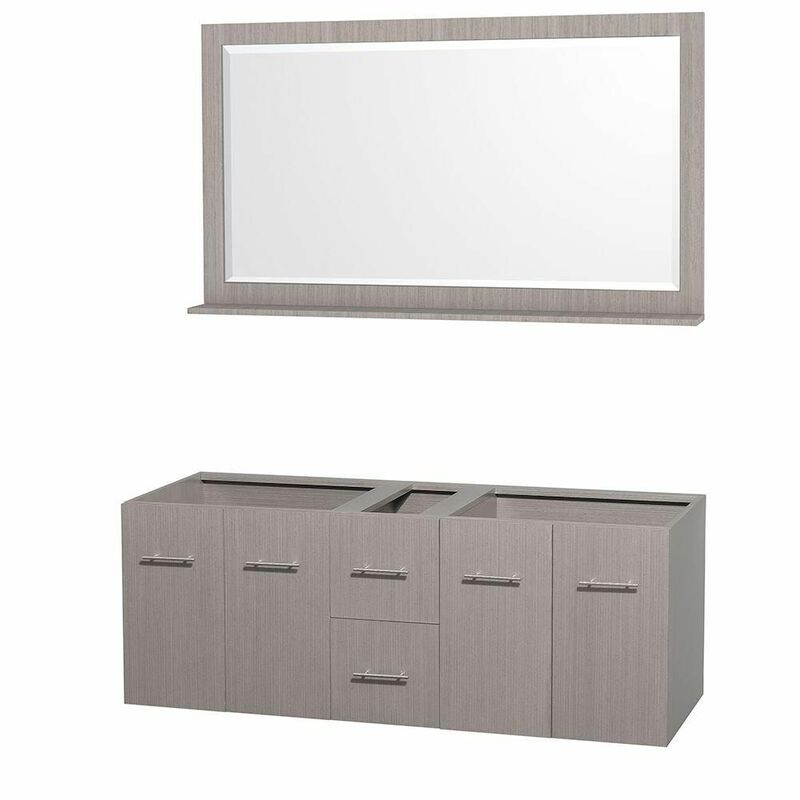 Centra 60-Inch Double Vanity Cabinet with Mirror in Grey Oak Simplicity and elegance combine in the perfect lines of the Centra vanity by the Wyndham Collection<sup></sup>. If cutting-edge contemporary design is your style then the Centra vanity is for you - modern, chic and built to last a lifetime. Featuring soft close door hinges, drawer glides, and meticulously finished with brushed chrome hardware. The attention to detail on this beautiful vanity is second to none. Available in several sizes and colors.